[AESTHETICALLY PLEASING IPHONE 8 PLUS CLEAR HYBRID CASE] The premium PC with TPU design highlights the beauty of your phone while doubles to hide metal plate for your magnetic car mount. Works with wireless charging. [DUAL-LAYER PROTECTION WITH RAISED PROTECTION] Dual layer polycarbonate (PC) and thermoplastic polyurethane (TPU) with raised bezel protect your iPhone 8 Plus from unwanted scratches and bumps. The slim iPhone 8 Plus case features polycarbonate (PC) frame and thermoplastic polyurethane (TPU) core providing your phone mild to moderate drop and scratch protection, perfect for everyday use. Raised bezel keeps the screen and camera above the surface when placed face down, keeping the screen and camera clean and scratch-free. The high-quality shock absorbent thermoplastic polyurethane (TPU) does not stretch out over time. With CornerGuard TM technology and unique pattern, Vena Harmony protects your Apple iPhone 8 Plus and disperses the force from shock and impact through the TPU case. 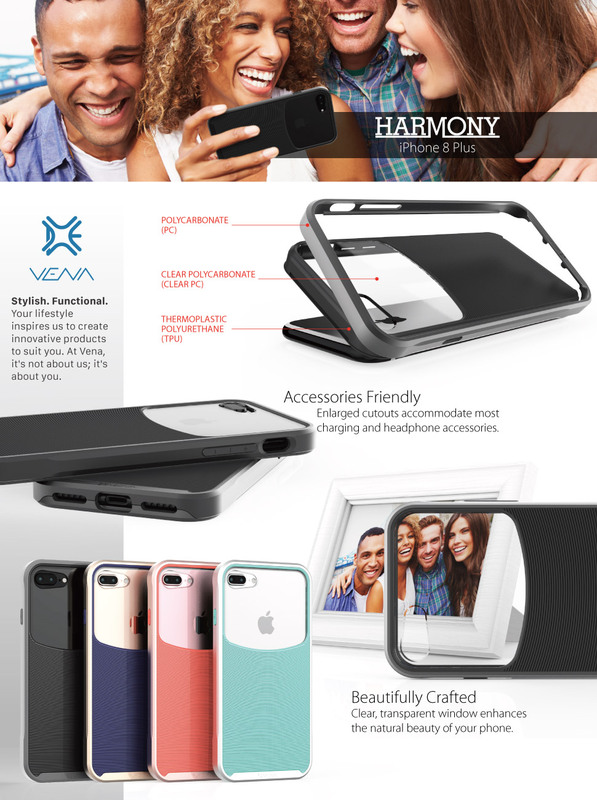 Vena Harmony is designed with precision cut-outs to suit the Apple iPhone 8 Plus and provides effortless access to all ports, buttons, and features. The beveled power and volume buttons are crafted to maintain the same great tactile feedback from your phone's buttons. Works with wireless charging for the iPhone 8 Plus.